Who didn’t like this game when they were a kid! This is just taking a beloved memory for many of our students or at the very least a nostalgic item from our past and making it life sized! 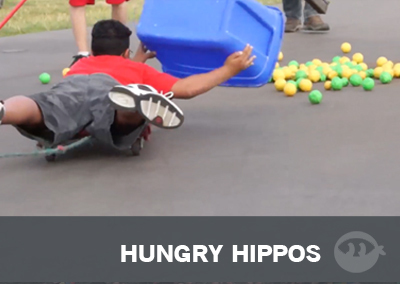 Who wouldn’t want to play this life sized edition of Hungry Hungry Hippos! 2. Dolly (x4). These are any four wheeled cart you can get your hands on. Many churches like ours have THESE that are used for facility items but why not re-purpose them for a weekend. You can also use carts like THESE which we have used for other games as well. Your choice either and both will work just fine. 3. Rope. You can use heavy duty rope that you can find at the hardware store or if you are feeling adventurous try using bungee rope for a little more excitement. How much rope you ask? Well measure the distance from each corner were the teams will be lines up and measure to the middle of the playing field. Add 5 ft and you should be in the right spot. Make sure you test it to make sure it’s just right! 4. Playpen Balls. 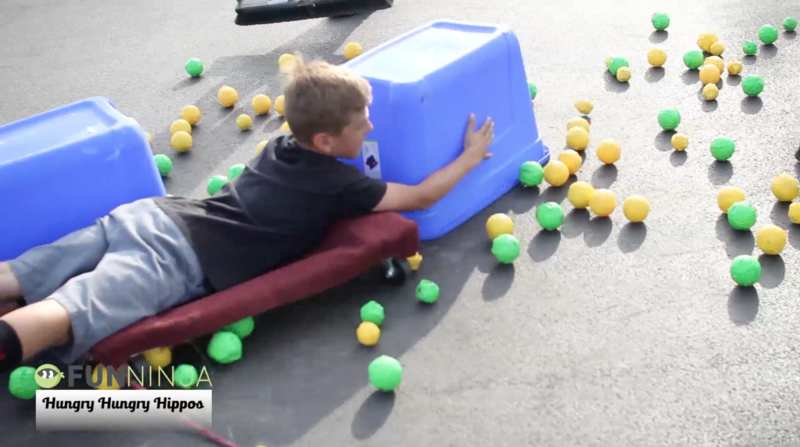 We used tape balls that we had from another game but a bunch of playpen balls will do that trick as well. Attach each rope to each dolly. Place the 4 dollies in different corners of the room along with a rubber maid tote in each corner as well. Place all of the balls in the middle of the arena. Each team will have their hippos who will be on the dolly face down. 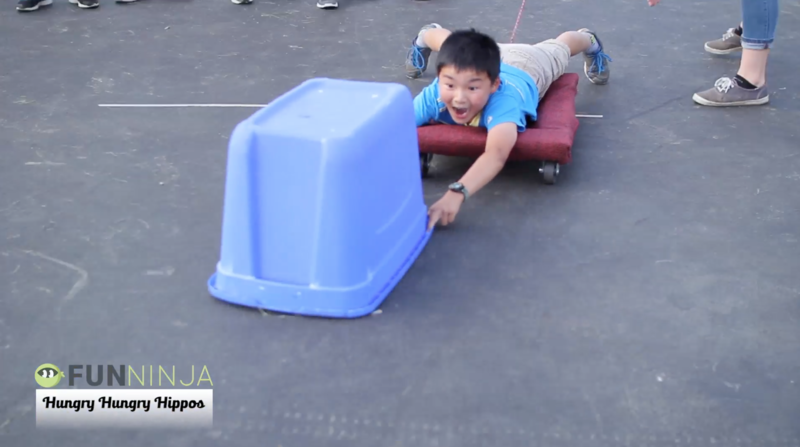 Each team will push their hippo out towards the center as the hippo holds the rubber maid container. 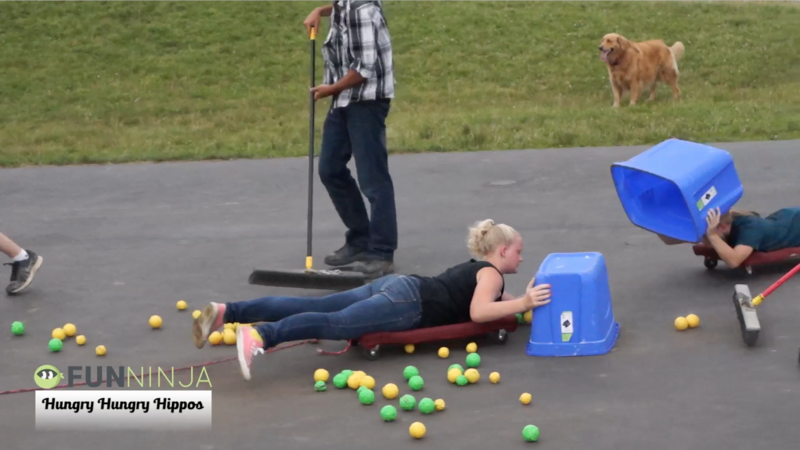 The hippo must attempt to scoop up as many balls as they can as their team pulls them back. Keep a pile of the balls with the team as the game is being played. At the end of the game count the number of balls each team collected. The team with the highest amount of balls is the winner. Just like the game we used to play as children but life sized. What balls do you use? You can just use playpen balls or you can use tape balls.